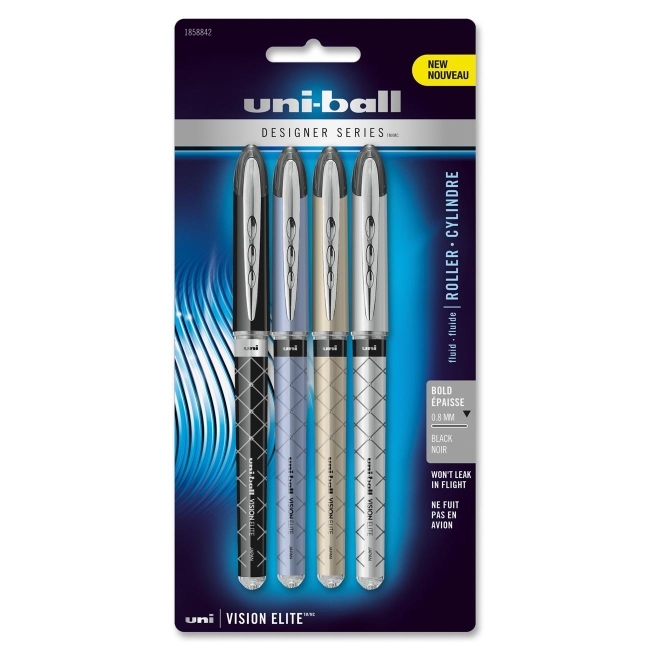 Elevate your everyday with the sophisticated style of uni-ball Designer Series. These Vision Elite Designer Rollerball Pens feature black barrels with graphic details and deliver consistent, free-flowing ink for fluid writing the moment pen hits paper. Airplane Safe-ink will not explode or leak due to a change in cabin pressure during flights. Exclusive uni-flow ink system provides consistent smoothness and color intensity. The uni Super Ink helps prevent check and document fraud. Each rollerball pen also features an 0.8mm tip for bold writing and pocket clip on the cap for easy attachment to notebooks and more.